Welcome back to NBA Draft week, readers. Can you feel the excitement in the air? Rumors are swirling, smokescreens are being puffed up, and big boards are sprouting from the ground like blossoms in the Spring. This is one of my favorite events and times of year. There’s so much intrigue about individual players, half the league’s teams, and the rookie class as a whole. This year, more than many others, features additional wrinkles that could make Thursday a draft for the ages. Half the lottery teams are ready to make a trade, with a cavalcade of stars seemingly available in the right deal (yes, the phone lines will be buzzing this week). Two of the five best teams in the NBA have top ten picks (yes, the Sixers fit that category). The greatest player of all-time is a free agent, ready to choose a new home (yes, he’s the best ever). On top of all of that, the incoming draft class appears strong. I see a top tier of two to four players capable of sustained All-Star level play, a second tier of more than ten players who could be All-Stars someday, and another two dozen guys who could contribute to a contender in their NBA career. The top of this draft isn’t eye-poppingly stunning, but there is tons of value to be had. There’s consensus among basketball thinkers that college basketball is inferior to international professional basketball. This makes projecting draft prospects from the college ranks exceptionally difficult. Stars at a level that low are then asked to make a jump to far superior competition in the span of one year. Scouting international prospects is certainly no easier, given the checkered past of imported draft picks. Many international prospects spend their later teenage years on top teams and receiving little responsibility and often lesser amounts of playing time. Kristaps Porzingis, for example, played 22 minutes and scored 11 points per game for a middling team in the best league in Spain. Others, like Giannis Antetokuompo, show flashes of dominance against bottom feeder competition. Luka Doncic may be the first prospect in recent memory to put this conversation to bed. The 6-foot-7 ballhandler led Real Madrid in minutes played, points, assists, and shots. Real Madrid went 30-4 in the Spanish League before advancing to, and winning the championship of, the EuroLeague. The EuroLeague is the second best basketball league on Earth. Doncic was its MVP and the best player on its champion as a 19 year old. There’s an argument to be made that his peak may not be much higher than his current level of play. His athleticism and measurements aren’t off the chart, suggesting limited room for growth. That may be true, but as he ages, he’ll grow into his body, getting faster and stronger. If his skills as a shooter and passer continue to develop, he’ll be among the most skilled players in the world. He may already be in that conversation as a passer. The next three players on this list may have higher ceilings and more shimmery, shiny potential. Right now, Doncic’s floor is as high as any draft prospect since Anthony Davis in 2011. No matter how good the other players in this draft become, it’s hard to imagine any team regretting selecting Doncic. On more than one occasion this season, I referred to Deandre Ayton’s potential as “Shaq with a jumper.” Now, you may say that’s lazy writing and I should have found a different comparison. I say that this blog could be rededicated to simply posting “DEANDRE AYTON MIGHT BE SHAQ WITH A JUMPER” hundreds of times per week. I mean, really think about that possibility. Shaquille O’Neal was one of the most physically dominating players of all-time. Ayton has the size and athleticism to remind people of O’Neal’s time in college, yet Ayton is in better shape and moves more fluidly. On top of that, he shot 73 percent from the foul line and 34 percent from the 3-point range. Joel Embiid has made 33 percent from outside the arc and requires opposing centers to stray from the rim and find him as a trailer in transition. Ayton’s shot is mechanically sound, leading to a soft touch in the mid-range and around the blocks. He doesn’t have an arsenal of post moves or a defined offensive attack yet, but has shown the skills to develop into an effective post scorer. The main worry about Ayton is his defensive effort. Even though he averaged 1.9 blocks and 8.2 rebounds per game, Ayton was often outworked in the paint and out of position. It didn’t help than Arizona played Ayton as a power forward alongside a slower center in the paint. With some NBA coaching, he may never be an elite rim protector, though he should be a passable defender. He certainly has to the physical tools. Hell yeah, it’s time for TAKES. Most draft rankings look fairly similar, with many prognosticators herding toward the same opinions. As that’s happened over the last few months, Sexton has been sliding down most boards and mock drafts to the late lottery. Frankly, I have no earthly idea how that’s possible. I feel like I watched a different player than every other person scouting this class. He was leaps and bounds better than any player who attempted to stop him in his lone season at Alabama. He drew the 7th most fouls per 40 minutes in college basketball, though no guard from a power conference forced more whistles than Sexton. His ability to blow by any defender in transition and in the half court proved to be a nightmare for opponents. In order to project to stardom at the next level, a speedster like Sexton has to be able to reliably knock down jump shots. Compared to similar players in their final season prior to the NBA, Sexton was arguably the most prolific shooter and the only member of the group above that did not play with another future first-round draft pick. Sexton shouldered the majority of the offensive load for the Tide this season, posting the highest usage rate in the SEC. He also showed a killer instinct on the defensive end. Sexton looked possessed during his efforts to stop Trae Young when the two met in January. Young shot 6 for 17, attempted only two free throws, and committed five turnovers. 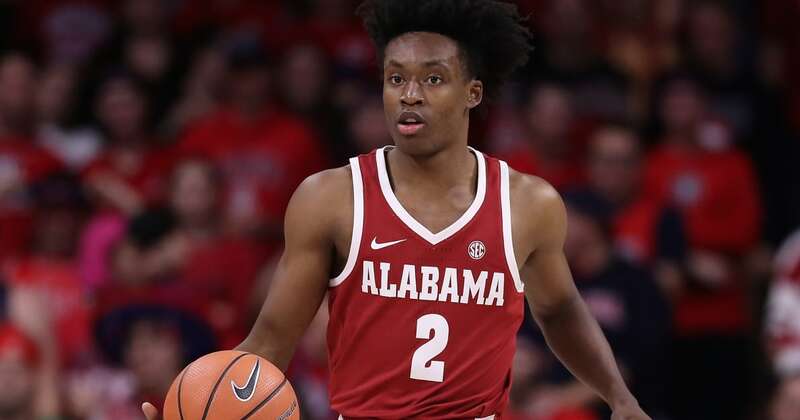 Collin Sexton led the Crimson Tide to a much needed win, with the same swagger he showed when he told (now Memphis head coach) Penny Hardaway that his son was “trash” during a high school game. God bless the fine folks tasked with playing Collin Sexton on a nightly basis. He’s going to enter the NBA like a rabid dog running into a butcher shop. Welcome to basketball in 2018, where versatility and variability are paramount. Jaren Jackson Jr. showcased himself as a modern, malleable big man in his one season at Michigan State, playing just 21.8 minutes per game. In those minutes, he led the Big Ten in block rate, averaging an absolutely absurd 5.5 blocks per 40 minutes of play. On the offensive end, he was far from the Spartans first option, yet fit nicely into Tom Izzo’s offense. Jackson scored 20 points per 40 minutes, notably shooting 40 percent from outside the arc. A 7-footer who can protect the rim and step out beyond the 3-point line is very valuable in today’s NBA. Jackson projects as an elite pick-and-roll player, capable of popping for a jumper or running to the rim for a lob. Defensively, his agile feet and wingspan make him a possible All-Defense type player. Jackson’s offense is still a ways from polished, with a tendency to go missing at times. The freshman scored six points or fewer in seven games and only topped 20 points twice. In his final collegiate performance, against Syracuse in the NCAA Tournament, Jackson shot 0 for 4 from the field and scored just two points. No team selecting Jackson can expect him to be the savior next season. If paired with a capable coach and the right playmakers around him, Jackson can certainly be a star playing center in the NBA in the long run. 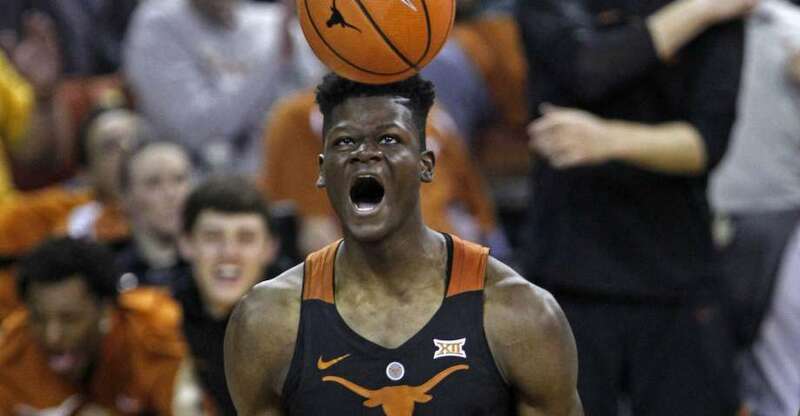 Scouts loved Bamba this season, yet they truly began to drool at the prospect of drafting him when the tape measure came out at the Draft Combine. Bamba measured a hair under 7-feet tall, yet boasted a wingspan of 7-foot-10. Bamba’s wingspan is larger than any player ever measured at the NBA Combine. His standing reach (from the floor to the top of his hands, extended above his head) measured 9 feet, 7.5 inches. Bamba did not run at the combine, yet his time in the 3/4 court sprint at his pro day would have tied the fastest time by any player at this year’s combine. It was also faster than the times of John Wall, Dwyane Wade, and Russell Westbrook. Bamba is, without question, a physical marvel. At Texas this season, he showed the ability to use his body productively. While anchoring Shaka Smart’s “Havoc” defense, Bamba was 5th nationally in block rate, posting 3.7 rejections per game. He also ranked in the top 5 in the Big XII in offensive and defensive rebounding rates. 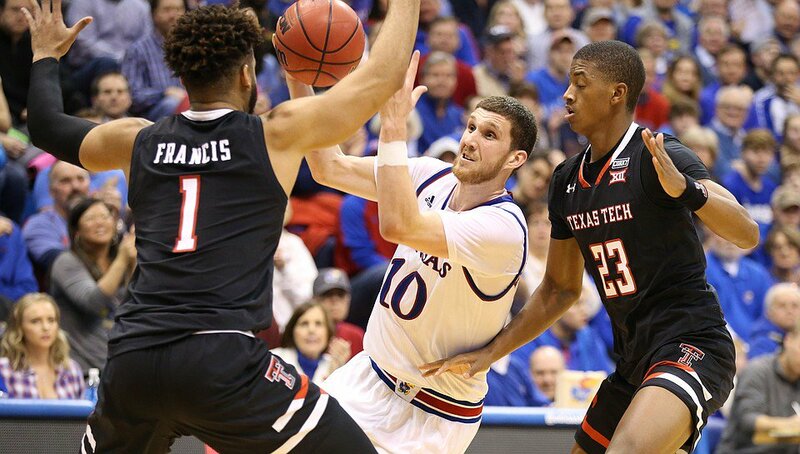 In a January loss to Texas Tech, the gangly center made every field goal he attempted, grabbed 10 rebounds, and blocked 7 shots. His season was full of box score-stuffing performances like that. Though he may never score 20 points per game, Bamba could be a gamechanger at the NBA level. Thanks, Mo Bamba. Duke’s star freshman enters the 2018 Draft with one of the more interesting prospect profiles in recent memory. He was a dominant high school player. He played huge minutes on a top college team and produced immediately. And yet, there are tons of question marks. Bagley scored and rebounded at will in his time at Duke. Meanwhile, he played below average defense, barely ever made passes out of the post, and played a style of basketball rarely found in 2018. As a slight-framed 6-foot-11 power forward, Bagley scored most often with his back to the basket, operating out of the post. 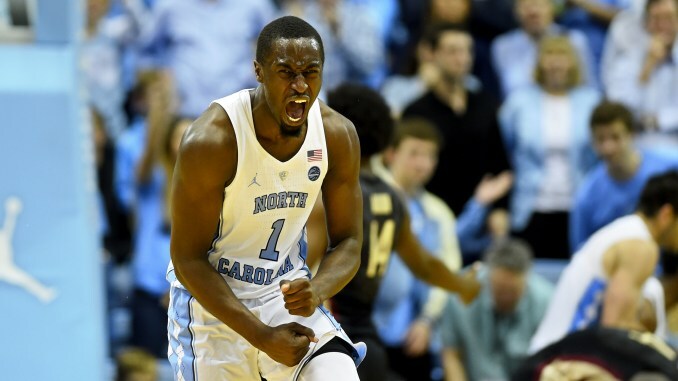 At times, he was successful as a roll man or rim-runner in transition, but those pieces of his game will need to be more prominent as he enters the NBA. 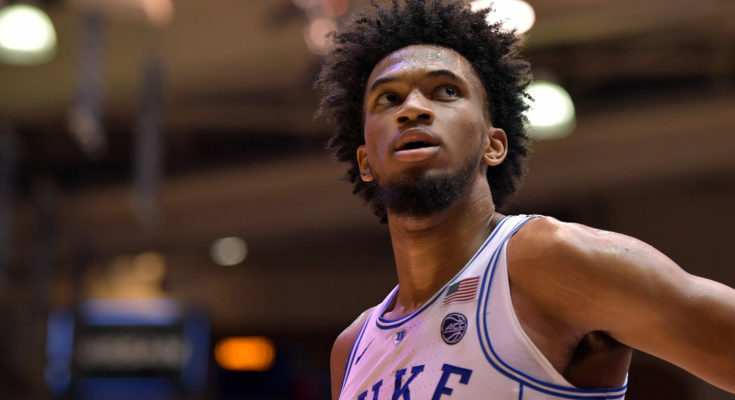 In studying Bagley’s statistical profile, I found the five player-seasons that KenPom’s algorithms called most similar to Bagley’s first year quite intriguing: Jahlil Okafor, Cody Zeller, Jared Sullinger, Julius Randle, and Kevin Love. All five seem like completely plausible outcomes for Bagley. He could be a total bust like Okafor. He could be a flawed star like Kevin Love. He could also be a productive journeyman like Zeller or Sullinger. I suspect his first several seasons may resemble those of Randle, productive at times, with some moments of brilliance and a lasting sense of potential moving forward. He’ll need the right situation to unlock that potential and his possible production (so, Sacramento….stay away). Bridges starts a new tier of prospects, where the debate centers around ceilings and floors. This high in the draft, teams are desperate for a player with a high ceiling and a chance for stardom. Often times, teams will overemphasize that quality, ignoring players with a more clear, defined, and realistic shot to become a useful NBA asset. Months ago, I would have firmly defended Bridges as a player with a high floor and a great chance to be a solid rotation player. After what he did in February and March, it became clear that Mikal Bridges can be much more than a helpful cog. In those two months, Bridges played elite defense and scored 18.7 points per game on 53/44/87 shooting. He was not the second banana to Jalen Brunson or anyone else. Bridges knocked down difficult shots in traffic, off screens, and with hands in his face. He can truly be a star. He slots 7th on our board because while he has a chance for stardom, his worst case scenario still leads to minutes on the floor, strong defense, and a capable shooting option. The way Bridges played in March made him look like he could have simply changed uniforms and stepped onto the floor in any NBA playoff series. Would the Sixers, sitting with 10th pick in this draft, have loved a guy like Bridges to defend and make shots against Boston? Would LeBron kill for a guy capable to make a contested jump shot while switching onto multiple positions defensively in these NBA Finals? It’s hard to find a situation where Mikal Bridges doesn’t fit and wouldn’t produce right away. From one M. Bridges to another, and the message essentially stays the same. 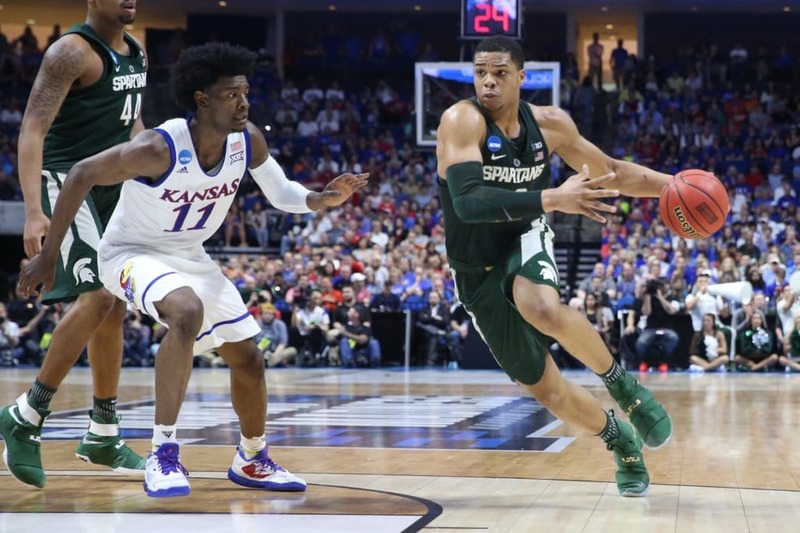 Miles Bridges is built for the 2018 NBA. He’s thick enough to guard most power forwards, quick enough to stick with guards when switched, plays above the rim, and shoots well from beyond the arc. In the archaic landscape of college basketball, some criticized Bridges (again, Miles now, not Mikal) for shooting too many outside shots, rather than attacking the rim. With the right coaching staff in the NBA, he’ll be encouraged to continue shooting threes, making his aggressive drives to the basket more accessible. He has the athletic tools to be a monster in open space. I was at the Michigan State-Penn State game at the Palestra last season, where Bridges was nursing a sprained ankle and still made one of the most impressive plays I’ve ever seen with my own two eyes. With the right set of circumstances, everything could click, leading Bridges to Rookie of the Year, All-Star Games, and much more. At worst, he’ll never look like he doesn’t belong in the league. Drafting an NBA player has less to do with intangibles than drafting an NFL quarterback. Football analysts love to compare finding a quarterback to hiring a CEO, saying that the mental and emotional side of the game is more important that physical skills. The NBA Draft process is more about mining for red flags or separating those with a true competitive streak from those who require more motivation. Shai Gilgeous-Alexander appears to be the former, given the course of his season at Kentucky. Scouting Kentucky players can be hard, given the nature of that program. Every season means a nearly new rotation of players, all fighting for playing time and shots. SGA was not expected to start at point guard for Coach Cal, and only started twice in the Wildcats first 15 games. He earned playing time and responsibility in the offense, slowly becoming not just a starter but Big Blue’s go-to-guy. SGA started all of Kentucky’s final 22 games and saw drastic increases in production. Gilgeous-Alexander proved himself to be undeniable this season. Whoever takes him in the late lottery may have found this year’s Donovan Mitchell. Of every player on my board, there’s none I’m more scared is ranked too low than SGA. Carter’s freshman season makes him a difficult player to scout. He was at best Coach K’s third scoring option, but in reality, played more like fourth or fifth in the pecking order. People are quick to compare Carter to other unheralded players from stacked college teams, like Al Horford or Karl-Anthony Towns. There is something to be said for doing the yeoman’s work while other people take the spotlight. Even playing fourth-fiddle to the other Blue Devils, Carter scored 20.5 points per 40 minutes and notched more than 2 blocks per game. He also nabbed 9.1 rebounds per game, while playing next to Marvin Bagley who averaged over 11 rebounds per game. Carter was downright efficient with his chances, especially on the glass. He ranked in the top 100 nationally in offensive and defensive rebound rates, and top five in the ACC in both those categories. Carter also shot 41 percent from beyond the arc on more attempts last season than guard (and soon to come on these rankings) Zaire Smith. 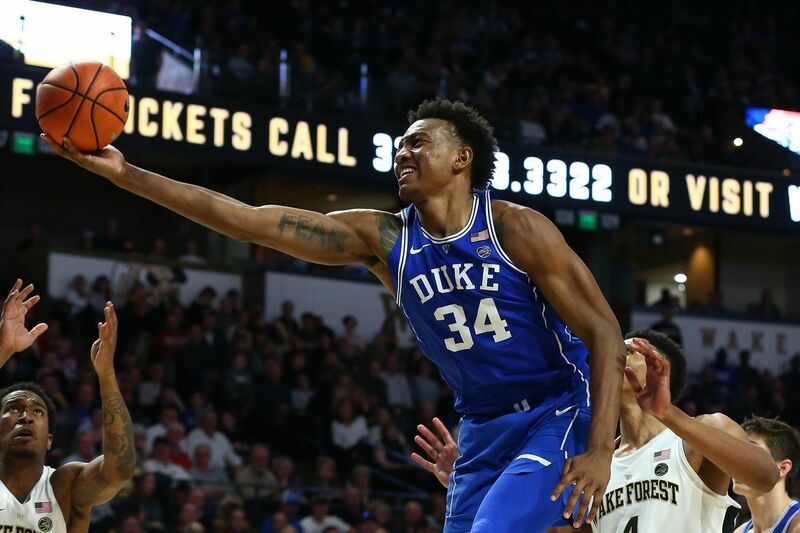 At worst, Wendell Carter will be an Amir Johnson, Aron Baynes, or Derrick Favors. But there’s also a chance he’s Pau Gasol or Al Horford. Last year, I had my doubts about Jayson Tatum’s chances to translate his abilities as a shot-maker in the mid-range into a real NBA skill. Boy, that opinion aged well! To be fair, Tatum was drafted by one of the league’s smartest franchises and placed into one of the best offensive systems in today’s NBA. Had he been plopped into Sacramento or Phoenix or Orlando, his rookie season looks a lot different. Knox has a lot of the same question marks as Tatum. He’s a good but not stellar athlete. He does not handle the ball at an elite level. His defense is fine and only fine. But Kevin Knox can score. Basketball is about putting the ball into the basket. Drafting a guy who excels at getting buckets is never ill-advised. Time for a little bit of a disclosure notice. I rarely watch footage from these players days in high school or playing in AAU, Nike Hoop Summits, or international competition. I watch heaps and heaps of college basketball, even doubling back to games and highlights pre-draft for more information. Michael Porter played just 53 minutes of college basketball due to injury. He attempted 30 field goals and made only 10 of them. All of those minutes were played while suffering from or recovering from injury, and it showed. Porter did not look to be the stand-out athlete he was billed as coming out of high school. His decision making looked slow and rusty. His shot was rickety at best. It’s hard for me, someone who relies on college basketball primarily to form my opinions, to properly judge Porter. I say that knowing NBA teams have much more fully formed opinions of Porter and most importantly, access to his medical information. The Porter that was promised would be a top five player in this draft. The Porter we saw leaves something to be desired, especially after he cancelled his final workout this week due to a new injury. Hey! Trae Young! We remember Trae Young. He showed up at Palestra Back this season, on quite a few occasions. Young had one of the greatest college basketball seasons I’ve ever seen. He carried a mediocre Oklahoma team on his back into the tournament. Opposing coaches sent every flavor of junky clunky defense at Young to stop the Sooners. At times, it worked and Young looked worse than just mortal, but like a turnover-prone mess. It’s hard to compare what Young did with his Oklahoma teammates to what he’ll do as a member of an NBA team. He won’t need to force shots like he did at Oklahoma, nor face unprecedented defensive scrutiny. If Young can transition to a role as a part of an NBA offensive scheme, he’ll make open shots when he gets them, continue his pick-and-roll wizardry, and find open players for buckets. Young will struggle to score at the rim, due to his size. We saw him make many impressive shots in and around the paint, yet Young was a step behind other top prospects in terms of success at the rim. That size will limit Young defensively, where he needs to make the biggest strides. The defense he played at Oklahoma won’t afford him much playing time in the NBA next season, no matter how he shoots or passes. His lack of effort or mental lapses on defense could be explained away by the amount of energy Young exerted offensively last year, but that excuse only goes so far. He led the nation in usage rate and played 35 minutes per game, yet when push comes to shove, he never showed an ability to cover in man-to-man defense last season. Let’s handle these three as a group, since they are the same height, have the same wingspan, and in theory, will play similar roles for whatever team drafts them. Thomas is far older and more accomplished than the others, but less of an athlete than either Walker or Smith. To make things easier, let’s just toss a whole bunch of stats and analytics out there to compare. Thomas has the highest floor of the group. He has been, for at least the last two seasons, one of the premier perimeter defenders in college basketball. He shot 41% from the college 3-point line in over 300 attempts at Creighton. He’s a strong passer, rebounds for his position, and has all the intangibles you’d like to see out of a 22-year old. Smith is not only younger than the others, but his freakish athleticism is clearly functional in the game of basketball. Some guys can just jump out of the building and win a dunk contest (like Derrick Jones Jr. or Glenn Robinson III), but don’t use that skill to actually do anything useful. Smith uses his ability as a leaper to score at the rim, or get fouled, and he’s everywhere on the glass and on defense. He shot the best from outside the arc of the group, yet with so few attempts, that number could be a tad fluky. Walker doesn’t shoot or defend as well as you’d want for a probable role player. He also doesn’t score, create, pass, or finish well enough to ever be more than a role player. So where does that leave him? Walker is a bit reminiscent of Jaylen Brown. Built like a basketball player, yet a little raw right now. Brad Stevens and the Celtics tuned Brown into a real NBA scorer and defender. Walker would need the right coach and the right team to shape him into a productive player. So basically, Smith has the best chance at stardom. Thomas has the lowest chance of being a bust. Walker is intriguing, but a step behind the others in my mind. What if I told you there was a player who quietly dominated college basketball competition last season, that you never saw play and may have never even heard of? A 6-foot-7 wing player who averaged 26 points, 10 rebounds, and 5 assists per 40 minutes. A versatile scorer who shot 48/36/73 (FG/3PT/FT) last season, on the 11th highest usage rate in the nation. Drawing fouls at the 11th highest rate in college basketball, he tortured opponents. Did you forget his 44 point game against San Diego State? Or his 39 points and 14 rebounds versus Washington in the NIT? Of course you did, it’s the NIT. Point guards with 7-foot wingspans aren’t easy to find. Especially when they make 42 percent of their threes and have an eye for great passes. Milton checks those boxes, but isn’t a spectacular athlete and is already 21 years old. Shake is probably a backup in the NBA, though his size and ability to play multiple positions make him a valuable target. Also, his name is Shake. Nothing catches eyes faster in the NBA Draft than young prospects who also produced at the college level. Okogie played 61 games at Georgia Tech and averaged 16.9 points, 2.0 assists, 5.0 rebounds, 1.8 steals, and 1.0 blocks on 43/38/78 shooting. He then stepped into the draft combine and posted some outrageous numbers, finishing in the top eight in the shuttle run, 3/4 court sprint, vertical leap, and bench press. My biggest worry for Okogie is finding his role. He is likely not a star, thanks to his inefficient shooting and lack of court vision. Without those traits, his best case scenario looks more like a JR Smith type. There’s a time and place for that kind of player, but not until after the lottery selections have ended. The case is pretty simple for the “Michael Jordan of Delaware.” He’s an off-the-charts athlete, great shooter, and comes from a high-pedigree school. He defended well in college, initiated the Villanova offense at times, and dominated the National Championship game. The case against is also pretty easy. He didn’t start at Villanova, though would have nearly anywhere else. He flashed on the big stage, yet also had quite a few duds last season. 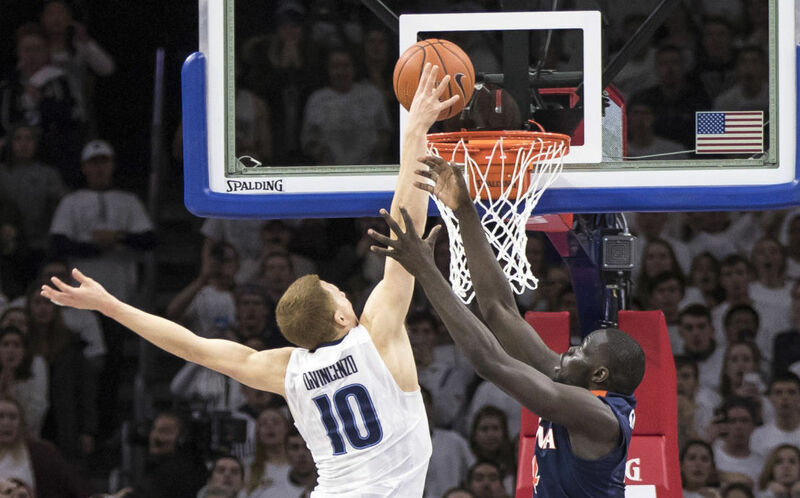 Just last season, DiVencenzo posted shooting performances of 1 for 9, 2 for 11, and 3 for 10. Even if his athleticism will keep him on the floor at the NBA level, his shooting and his ability to produce offensively could fail him. Remember Nik Stauskas? He could be Nik Stauskas. The former USC guard is one of the toughest players to project in this draft class. Melton had a solid freshman year in 2016-17, stuffing the stat sheet on both ends of the floor. For a combo guard who can play some small forward, he was active as a rebounder, shot blocker, defender, and finisher at the rim. Then the FBI started sniffing around college basketball. Melton’s commitment to USC was one of the key parts of the investigation, so the school chose to keep Melton sidelined, rather than risk having to forfeit any games he’d play. He would not play a single minute of basketball as a sophomore, and hasn’t played competitive hoops since March 19, 2017. His freshman stats and tape were intriguing, yet definitely left some questions unanswered with room for growth. Melton shot just 28 percent from outside the arc and scored 6 or fewer points in 14 of his 36 collegiate games. Any team drafting Melton in the first 20 picks has to hope he can be elite defensively and learn to improve his shooting ability as a young player. Wagner spent two years at Michigan causing all kinds of trouble for every defense in the Big Ten. He’s as versatile a big man on the offensive end as you’ll find these days. Maybe he can’t defend, but oh, well. He can be like, Channing Frye or something. That’s not bad. 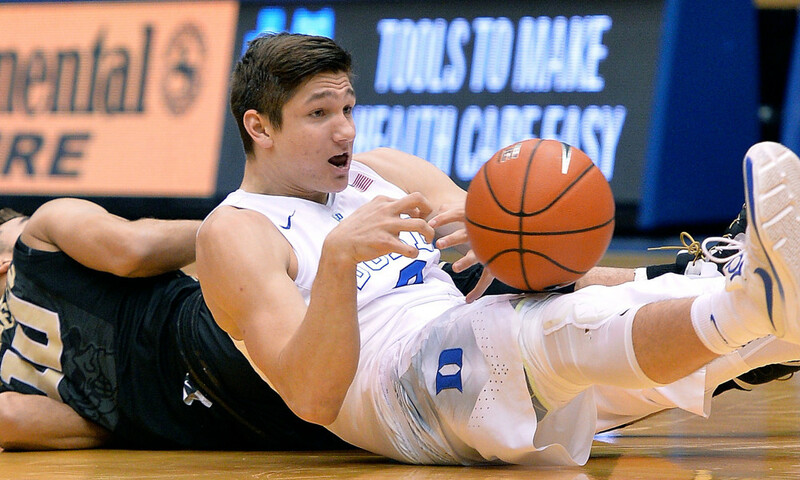 Just in case you weren’t sure how far down the board we’ve gotten, say hello to Grayson Allen. The four-year Dukie certainly ruffled some feathers and has his shortcomings. At the end of the day, however, it’s a pretty safe bet you’ll see Allen on NBA rosters for years to come. He shoots exceptionally well, with unlimited range and a quick release. He can create as a ballhandler in pick-and-roll. Most importantly, his athleticism gives him a chance to defend and excel in transition. I imagine whichever team selects Allen will spin his repeated dirty plays into a sign that he’s passionate and cares about winning. The NCAA Player of the Year showed just about every tool in his shed during his three years at Villanova. Short of Doncic, there is no player in this class with a more understood skillset and body type than Brunson. He makes open shots, finds teammates, wins games, and defends at a reasonable level. My biggest concern for Brunson in the NBA is actually a strength of his from his college days. The junior guard bullied opponents in the block, with a bevy of post moves and baby hooks that every 7-footer should study. I have big questions about whether he’ll be able to score on the post against NBA sized guards or, perhaps more importantly, if any modern NBA team will look to give their 6-foot-2 point guard post touches on a regular basis. Removing that element from his game makes his offensive attack look more like that of a backup point guard, which late in the first round is just fine. Though he injured his hand last week, Huerter should still have a chance to be taken late in the first round and could have an impact in the NBA. The Maryland sophomore is a great shooter, capable of making shots in motion, off screens, or with little breathing room. If he can use his size and athleticism effectively in the pros, Huerter could look like a knockoff hybrid of Klay Thompson and Kyle Korver. He’ll never reach the heights of those legendary shooters, but if he can be 80 percent of either he’ll find a role in the NBA. For a college freshman, Gary Trent is exceptionally NBA ready. His body has already filled out, his jump shot is pure, and his game slots in nicely to NBA offenses. If he can defend, he’ll earn minutes next season. If he gets abused on that end of the floor, he’d better shoot 40 percent from outside, or he’ll spend time in the G-League. He’s as big and athletic as any versatile bench big man in the NBA. That only takes a prospect so far. Sometimes, while he played at Texas A&M, he seemed disinterested in the sport of basketball. His scoring average decreased between his freshman and sophomore seasons. He had more turnovers than assists. He attempted 30 threes in two seasons and made two of them. Why he ever shot that many is a mystery for the ages. The right team could turn him into a weapon off the bench to rebound and block shots. Imagine a modern day Jason Maxiell or Chris Wilcox. We’re comping to Jason Maxiell in 2018, folks! Another Holiday? Yup, this is Jrue and Justin’s younger brother, with a different skillset than his siblings. 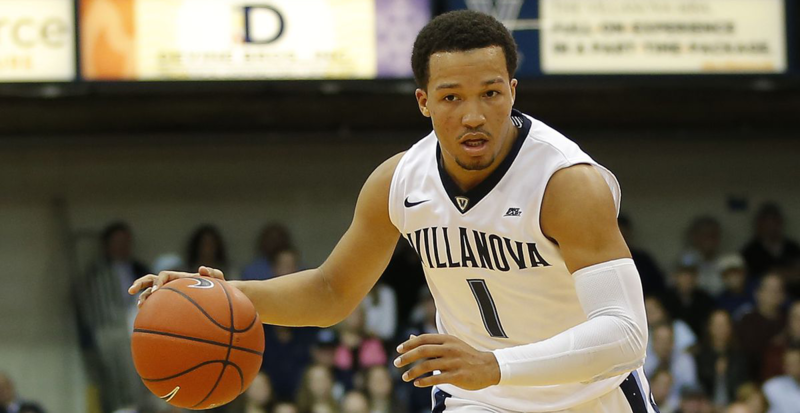 Jalen Brunson might be a backup point guard in the NBA. 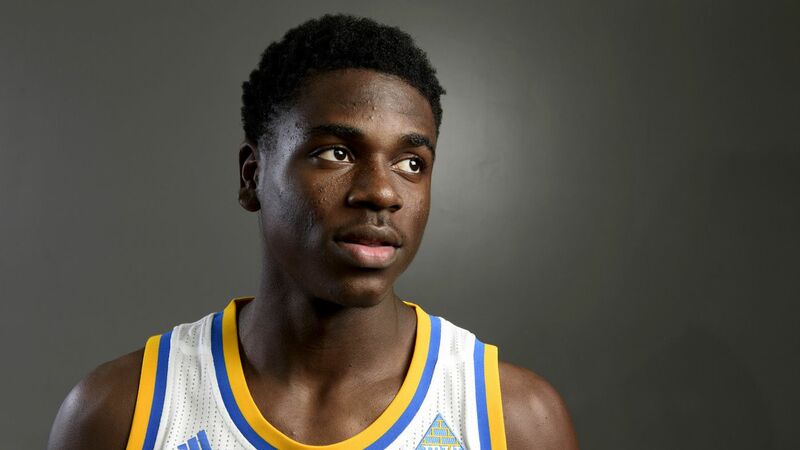 Aaron Holiday will fill that role. He might as well write it in pen on his next nine tax return forms now. Holiday lacks the spring or burst to be a capable starter, making up for it with high-level decision making and the ability to knock down shots. Really, really raw. He’s a piece of clay that needs to be molded into an NBA player. The freshman wing scored 11.5 points per game at Oregon last season, yet shot under 30 percent from outside the arc and averaged more than 3 turnovers per 40 minutes. For an 18 year old, his body is far along and absolutely ready for the big leagues. Now his skills just need to catch up to his physical gifts. This late in the draft, finding players with known and translatable skills is rare. Jevon Carter’s perimeter defense can absolutely be counted on. Sure, as a 22-year old senior this year, he’s expected to punish younger, less developed guards. Carter, however, has been a great defender for years. As a freshman he ranked in the top 10 nationally in steal rate. He’s always guarded like a pitbull in need of a meal. The bigger worry with Carter is his outside shooting, which improved from 31 percent his first two college seasons to 39 percent this past year. If he can be relied on to make shots when he’s open, Carter will stick in the NBA. I love me some Svi. He played four years at Kansas, yet just turned 21 this month. In his four college seasons, Mykhialiuk was asked to play a variety of roles. He defended 2 through 4 and rebounded for his position. Through it all, however, Mykhialiuk made sure to shoot the lights out. Since 1992, only 12 players in college basketball shot as many threes as Svi and made as high a percentage of those attempts. Is he the next Kyle Korver? He could be. Teams with high usage players like James Harden and LeBron James should take a flier on Svi, stick him in the corner and tell him to be ready to shoot. Give him a few hundred looks, he’ll make 40 percent of them. Simple recipe for Robinson in the NBA: come off the bench, run pick-and-roll successfully, defend adequately. If he can handle that, he’ll survive. He can fill a similar role, and similar minutes load, as Clippers rookie Jawun Evans. I’m a skeptic here, mostly due to Bates-Diop’s recent development as a late bloomer. He emerged from a season lost to injury as one of college basketball’s most productive players. Prior to this season, he was nowhere near NBA Draft status, and barely made a blip on the college basketball scene. There’s something to be said for improvement, but too much, too fast can be scary. Once considered a possible first rounder, Shamet’s stock cooled a bit this season. His defense was sub par all year, playing against tougher competition as Wichita State upgraded to the American Athletic Conference. 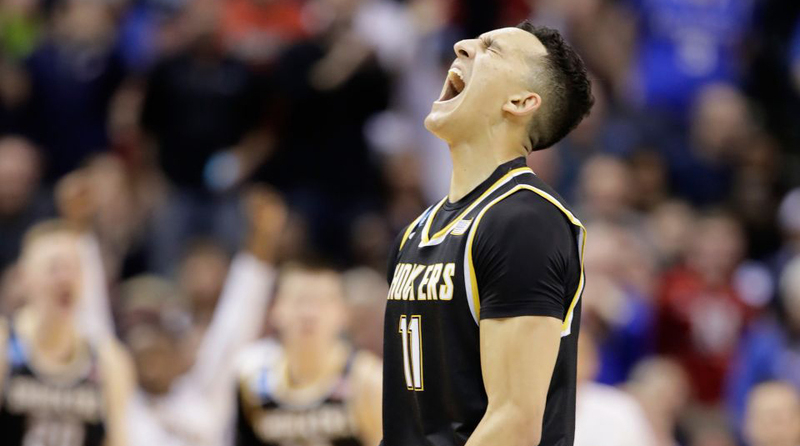 Offensively, Shamet still looked like a player who can make it in the NBA. He made 44 percent of his threes, on a high volume of shots, while creating offense for his teammates. At 6-foot-4, he has a long body for a point guard. If he gains weight and fills out his body, Shamet has a chance to develop into a nice player. It’s hard to properly judge Brown based on an injury laden sophomore season. That being said, he has not shown an elite skill in his time in college. Brown isn’t a shooter, making under 32 percent from outside at Miami and just 63 percent from the foul line this year. He is not a burner in the open court, by any means. He ran the 3/4 court sprint at the combine slower than Moritz Wagner. His best trait comes as the ballhandler in pick-and-roll action, yet without a smooth jump shot, he’s limited. Brown attempted 46 two-point jumpers last year, made only 14 of them, and none of those came via an assist. The team that drafts Bruce Brown will need to show some patience and sculpt his game. Let’s handle the Arizona backcourt together. On paper, Trier is the better player. He scores at an elite level. That right there should be enough for him to be a first round pick. We run into trouble when we dig a little deeper. Trier is 22 years old and was dinged twice for PED violations in college. Both seemingly had explanations, but when splitting hairs between second round picks, the reasoning behind the trouble starts to hold less water. On top of that, Trier plays selfishly on the offensive side of the floor. Last season, despite playing with a future top five draft choice, Trier averaged 11 shots per game. In his career at Arizona, he attempted 14 or more shots on 13 different occasions, with varying degrees of success. Efficiency is far from his strong suit. Rawle Alkins, meanwhile, played beside Trier for the last two seasons. Alkins played more within the flow of the offense, but more importantly, was a ferocious defender. This late in the draft, teams are better off fishing for a highly capable role player, rather than trying to mold a guy who thinks he is a star. We’ve reached the point of the draft where you’re a viable selection if you check a box or two. Jackson has the body for the NBA, shot 39 percent from 3-point land at Maryland, and rebounded his brains out. Three boxes? Worth a pick. He can defend and he can get a bucket off the dribble. Say what you will about the modern style of play or what teams expect out of role players, but on a random night in January against some nondescript Western Conference opponent, a few buckets and a few stops go a long way off the bench. He’s an athlete, but more importantly, he’s an excellent passer. If he can replicate Sean Livingston’s post-injury style, he could be a solid bench contributor. An isolation scorer than will need to prove he can produce as a role player. It’s possible, especially if he defends like he did in college. Kentucky looked worse when he played this season. Unless there was some particular reason for that beyond his play, I’d stay away. He’s gotten some big time buzz leading up to the draft as a hidden gem, thanks to some serious athletic ability and a breakout junior year. If it takes until junior year to breakout at Tulane, that’s a problem. 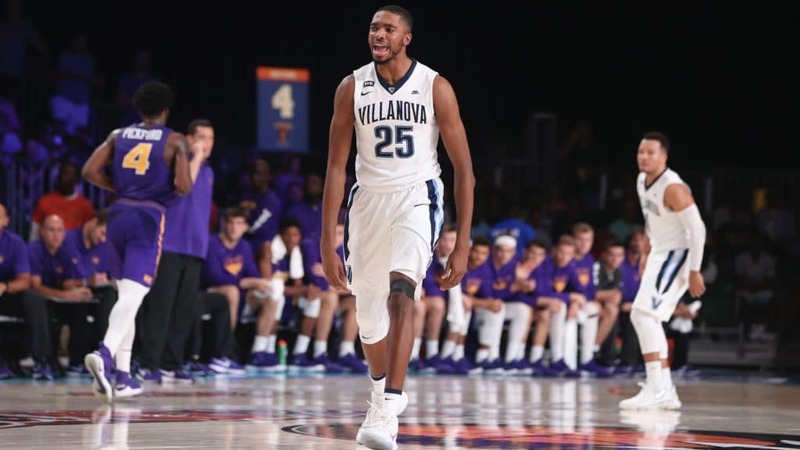 Mikal Bridges was unplayable as a true freshman at Villanova, but then contributed to championship team and was the best player on another. In three seasons at Tulane, Frazier shot under 30 percent from long range, had more turnovers than assists, and averaged just 6.4 rebounds per 40 minutes. He’s worth a second round flier just based on his physical profile, yet he’s far too raw for a guy about to turn 22 this summer. He might as well tattoo the words “THREE AND D” on his forehead. At a certain point, you can just play basketball. (See McConnell, Timothy John for reference). Graham can shoot, handle the ball, and defend. Worth a tryout. If Spellman were 6-foot-11, he’d be in the top 20 of this list. Alas, he is not. At 6-foot-8, I struggle to see what purpose he serves in the NBA. Unless an NBA team thinks he’s as versatile as Draymond Green, he’s an undersized power forward with a decent, but not great, jump shot. He’s not his brother and never will be, but if you’re picking past midnight, why not take a 6-foot-10 Stretch Armstrong action figure? Put him in the G-League and see what happens. French point guard with an NBA style game. Oui Oui! Reminds me of Furkan Korkmaz? Take that however you want. He’s HUGE. This late in the proceedings, that’s enough. Off the list: Kenrich Williams, Trevon Duval, Melvin Frazier, Anfernee Simons, Malik Newman, Mitchell Robinson, Dzanan Musa, Devon Hall, DJ Hogg, Donte Ingram, and many more! This post was brought to you by Lyft! Take $5 off your first ride.